Ford has been awarded the top German honor for the new three-cylinder turbocharged 1.0-liter EcoBoost engine that will arrive in the new 2014 Ford Fiesta. U.S. buyers will get to experience what the Europeans have already found out. The new Ford 1.0-liter three-cylinder turbocharged engine is small but mighty. The new 1.0-liter EcoBoost engine will make its debut in the U.S. in the all-new 2014 Ford Fiesta. The 1.0-liter EcoBoost engine has won Germany’s top award with the International Paul Pietsch Award 2013 for technological innovation at German magazine Auto Motor und Sport Best Cars Awards. The engine is impressive with its power, class-leading fuel-efficiency and low emissions and the list of awards continues to grow. This newest award is the fifth that Ford’s 1.0-liter EcoBoost engine has won globally since launching in spring 2012. The list includes the Dewar Trophy from the Royal Automobile Club in Great Britain, a Breakthrough Award from Popular Mechanics magazine in the U.S and 2012 International Engine of The Year from Engine Technology International. The latest award is chosen by a jury of 30 Motorpresse Stuttgart Group editors-in-chief from 22 countries worldwide. The small EcoBoost engine was picked from a shortlist of 12 innovations and was praised for its class-leading fuel economy and emissions. “This award goes to a technology that has made such an impact in the automotive world. The Ford 1.0-litre EcoBoost engine makes a real difference; it performs well, is great to drive, uses a very modern and light construction and it represents green technology,” said Bernd Ostmann, Auto Motor und Sport publisher, at the award ceremony in Stuttgart. 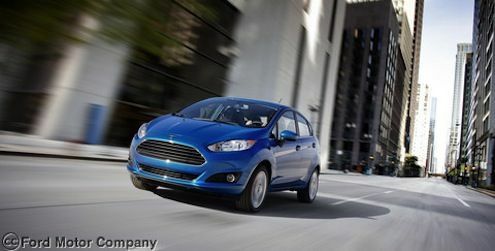 Ford last year confirmed that the 1.0-liter EcoBoost will make its North American debut in the new 2014 Ford Fiesta. The Fiesta is the most popular car in Europe and comes equipped with the small and mighty engine. 40 percent of new Fiesta buyers in Europe are choosing the fuel-efficient engine. The 1.0-litre EcoBoost engine is also currently available in Europe in B-MAX, Focus and C-MAX models. 72,000 1.0-litre EcoBoost equipped Ford vehicles have been sold in Europe to-date. When it arrives here in the U.S., Fiesta is expected to be certified as the most fuel-efficient non-hybrid car in the U.S.
With new global emissions and fuel mileage standards, automakers are turning to smaller turbocharged engines. The new 1.0-liter EcoBoost is the junior member of Ford’s growing global family of EcoBoost engines, which includes 1.6- and 2.0-liter four-cylinder, and two 3.5-liter V6 variants. Ford’s EcoBoost technology combines direct fuel injection, turbocharging and variable valve timing to enable a “downsized” engine to reduce consumption by up to 20 percent over larger engines with no loss of performance. Ford is currently launching the all-new 2014 Ford Fiesta in Europe which features the 1.0-liter EcoBosst engine and is arriving in dealerships now. Look for the North American launch of the new Fiesta with the three-cylinder engine later this year. The old Suzuki 'Swift'/Geo 'Metro' with the one litre I-3 could easily hit 50MPG driven properly. I wonder what the new little Eco Boost, manages? 45 mpg with the NEW EPA test cycle and today's standard safety equipment, which would drag the old Geo down considerably.